Considered somewhat of a pauper’s dish due to the inexpensive ingredients used, this dish is not to be mocked! It’s actually a very healthy, tasty dish and for perfect for cabbage lovers! 1. Wash and clean the chicken and if using breast pieces only, cut into 2 inch size pieces. If using the whole chicken, make sure it is cut into medium sized pieces. Remove all skin. 2. Wash and cut the cabbage into thin strips. 3. Dice the onion and garlic finely and keep separate. 4. In a pan, heat up 2-3 tablespoons of oil. Add the garlic and fry until almost brown taking care not to burn the garlic. 5. Add the diced onion and fry until brown. 6. Add all spices as above including the salt and fry for 2 minutes. Add 1 cup of water to make a smooth paste. (If you have a blender, fry just one onion and blend the other. You will still need to add some water, but not as much). 7. Once you have enough massala, add the chicken. Put the heat on high and allow to cook until the chicken browns all over (10-12 minutes if using a whole chicken, 5-7 minutes if using chicken breast). Add water as necessary if you start to see the massala drying up. 8. Add the cabbage and stir well, allowing the spices to mix into the cabbage. Cook on high for 4-5 minutes. 9. Add 1 cup of hot water, stir well and put the lid on. Lower the heat and simmer for 10-15 minutes until both the chicken and cabbage are fully cooked. This dish shouldn’t be watery, so dry it up on high heat for a few minutes if need be by removing the lid. 10. Remove from heat and sprinkle a generous amount of fresh chopped coriander leaves all over. Recommendations: Serve with hot rice of your choice or any bread of your choice such as roti, chapatti, or naan bread. For a healthier option, serve with wholewheat pita bread or wholewheat chapatti. Hi Asiya, thanks for your comment and recommendation to others. This is now one of my husband’s favourites and something my mum used to make a lot when we were growing up and didn’t have a lot of money. It’s cheap, filling, easy to make and super tasty. Can’t go wrong! I have tried it with the addition of a 400gr tin of chopped tomatoes. 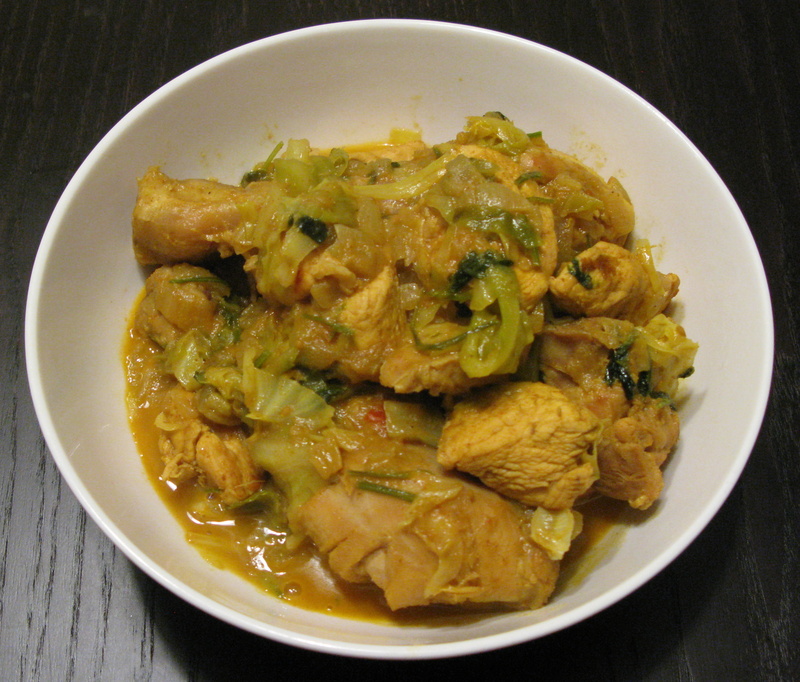 I have never cooked cabbage and chicken in the same pot and decided to look for a curry recipe to try when I stumble across yours. I tweaked the recipe a little by adding bell peppers and marinating my chicken for a couple hours, but it didn’t turn out too bad. I have bookmarked your page and will cook this again but adding less water. I also saw another recipe that I will try one day…tilapia Bhuna. Thanks for sharing! I had half a cabbage in the fridge and had no inspiration as to how to use it. I am so glad I came across this recipe. It was delicious and very easy to make!